A lot of gamers could identify themselves with the word Tardy probably. How many of you have been finishing something or trying to find a save point before they were able to go to a social event, making them just that tad late? The game tardy can maybe also make you a bit late, as you try to find your way out of remote locations and narrow situations, not being satisfied until you solved some part of the game at least before you leave. Tardy starts out with the main character named Ramto, which obviously is who you play as. 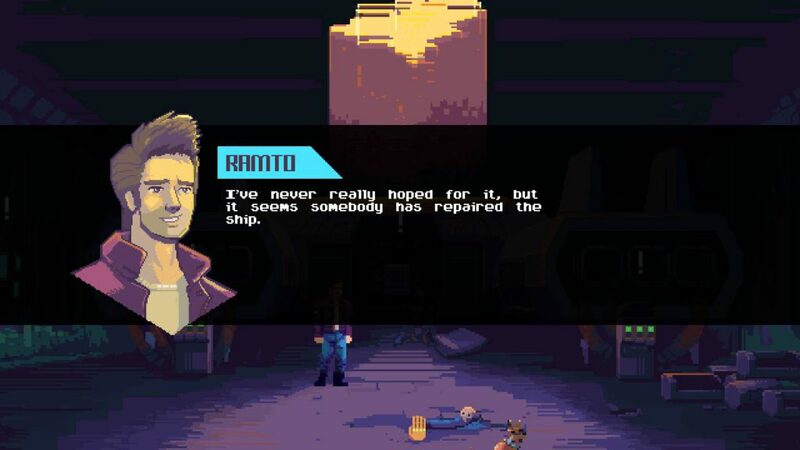 Ramto almost seems to be modeled after Philip J. Fry from Futurama judging by his blue jeans, white shirt, and red jacket, but he is a lot more grumpy and pixelated. The grumpy part is not so weird, seeing he wakes up on an abandoned and half-broken spaceship with no clue what to do to either make progress or to fix his own messy life. Luckily, he quickly meets somebody else who guides him through the loneliness a bit, but also puts him in front of a choice to stop being an egotistical douchebag and do something important with his life by helping her out. As the story progresses, conversations take place and a small amount of slightly animated cutscenes take place to explain a bit more of what is going on, and to link the locations you play at to each other. In terms of the quality of writing, it’s a decent job. Mainly Ramto develops himself through different attitudes, and you feel like there is something important to do most of the time. With the invisible word nostalgia screaming in your face during your entire playthrough, the graphics are a treat. 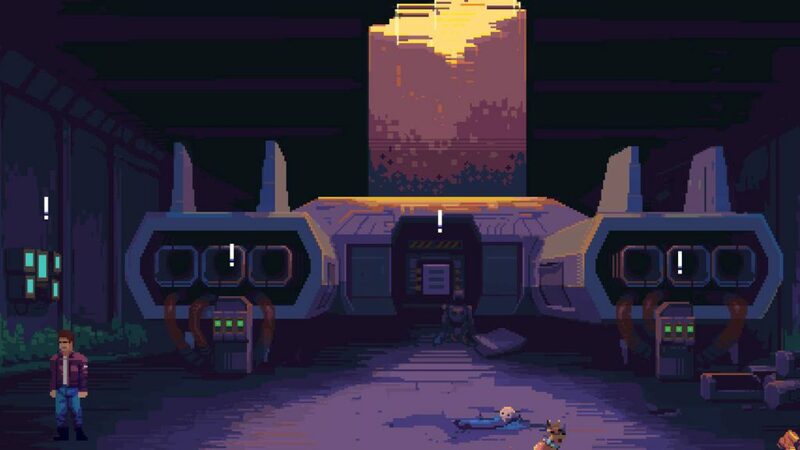 There’s a lot of high-texture 8-bit to be seen, recognizable by the broad dithering (the smooth transformation from one color to another by using pixelated patterns) from that era, and a certain serious color palette that’s creating a very nice atmosphere. It has a seriousness to it that keeps you interested and entertained. Especially combined with the Sci-Fi theme that Tardy has going on, you never fully know what to expect once you are done with a room and move up to the next. 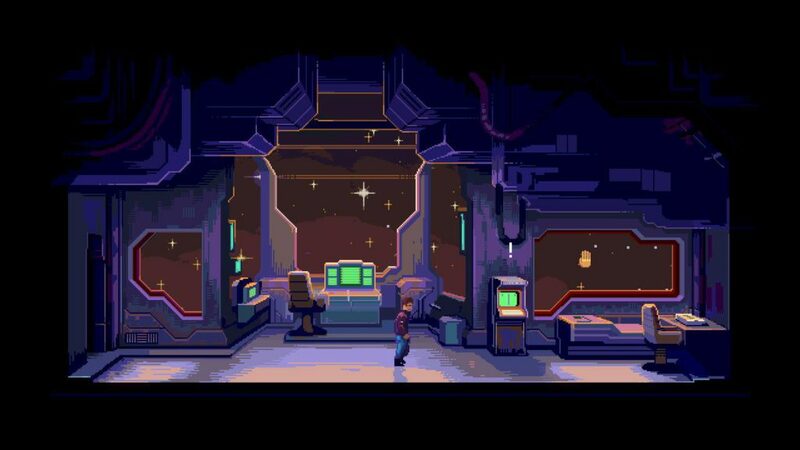 The cutscenes sometimes seem like they could have used slightly more work since they don’t seem as detailed as the environmental level design, but in terms of simplicity, they also kind of fit in the retro theme. The sound can best be described as ambient. Since sound effects and voices are missing, you will be pulled into the atmospheric experience even more. Your focus will be on the tasks at hand while feeling that you are at a mysterious, often abandoned location. Tardy is partially shrouded in mystery, and it works well. You’re probably not going to miss any of the other sounds that could have been made to polish the game even further. Tardy is a classic point-and-click game, that actually feels a lot like an escape room experience. This due to the way the game is build up. Most of the time you will be in a single room, which you, once you’ve completed it, will never come back to. Every room has a few interactable items, and it’s up to you to figure out what needs to be done and how to do it. Some items or places you interact with give you an item such as a manual or special glasses that allow you to see a different spectrum, allowing progress to be made. These items will always be on top of everything you’re looking at, whether you are walking around the room or interacting with something. If you don’t find any use for them anymore, you are able to leave them behind at most items, kind of using these interactable objects as a storage space. It takes a bit of getting used to but it also breathes some originality that’s also directly linked to that escape room feeling, where you often will use multiple objects in front of you to figure something out at the same time. Tardy could be summarized as collect, observe and connect (the dots). It’s fine to know what to expect from a game, but Tardy also sometimes has a bit of a stretched feeling to it. When you know you will end up in another room full of puzzles just after being done with a tough one, it can feel slightly demotivating. 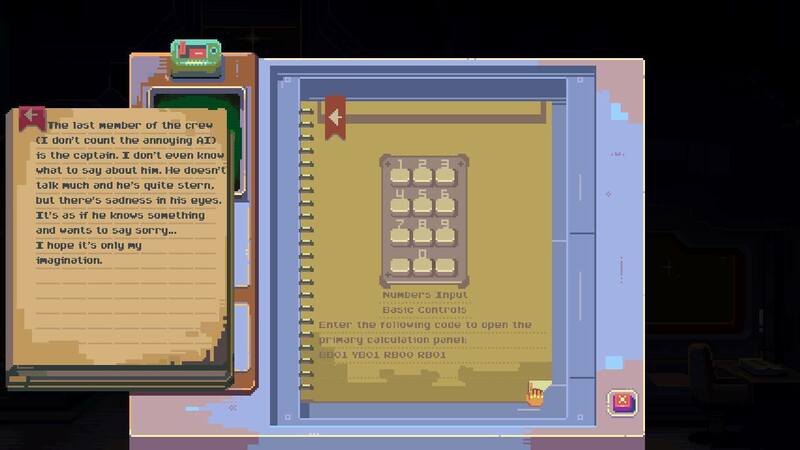 Especially because most of the puzzles involve terminals and buttons, and you need to click each button separately even when dealing with letters or numbers that need to be put in. When doing something like a login plus password on a computer, and you need to fill in both every time you are wrong, this can feel more like an annoying task that’s asking you to stay calm more than anything else. There is just enough story in-between rooms and sometimes puzzles to keep you busy, but it’s probably the major point of critique on Tardy as a game. Even though the puzzles keep their originality and ask you to use your wits since they are not always easy, overall it sometimes feels like it’s slightly repeating itself nonetheless. There are some obligatory arcade games built inside the game such as pong and space invaders, but they are not elaborate enough to really give that feel of something different or new. And just sometimes, it would be nice to have a small hint with certain puzzles as well to make sure you don’t get stuck too long. Tardy places something on the table that feels nostalgic in a great way, yet updated for modern comfort, controls sometimes excluded. It has atmosphere and mystery, which makes it a great setup for a point-and-click type of puzzle game. The puzzles are challenging and mostly fair, yet it misses a slight amount of change that could have made the game even better. The story will probably keep you going through, and altogether it’s a nice enough title to keep yourself busy for a couple of gaming sessions.